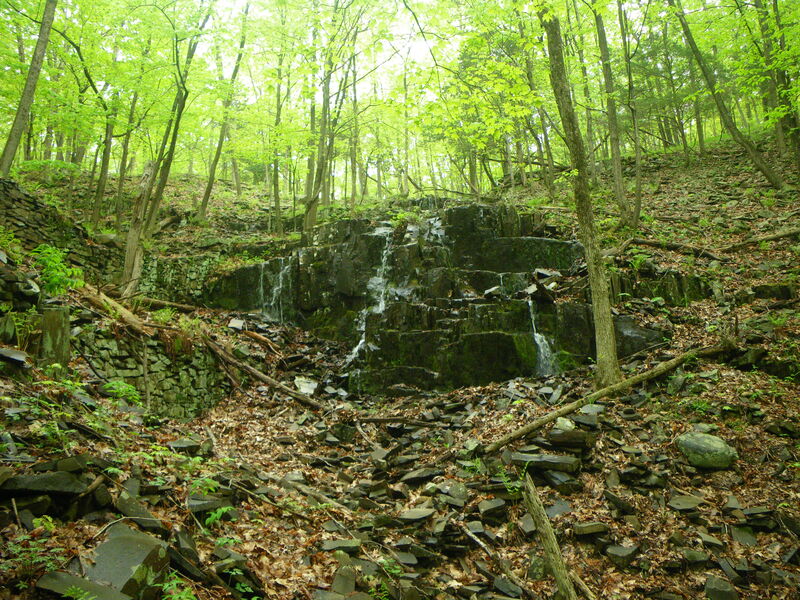 Our first hike in Connecticut was the Ragged Mountain loop. 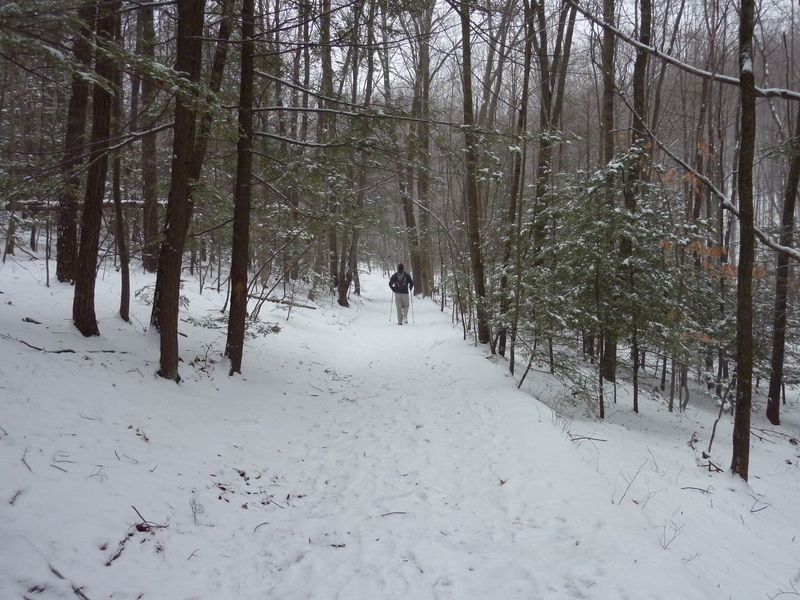 It was a trail that enticed us enough to keep returning to it in every season and in different weather conditions. We’ve hiked it in rain, blazing heat and even during a snowfall. This first hike was a revelation. 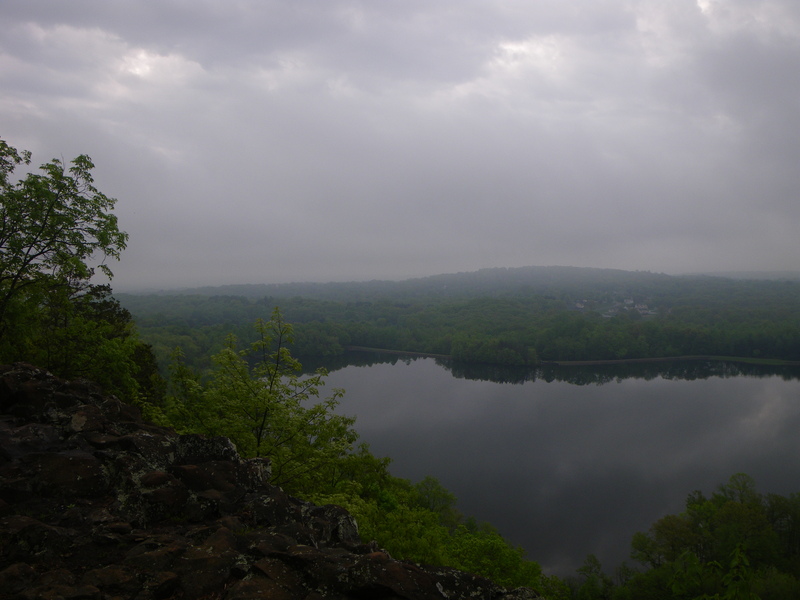 It all started on a foggy and soggy Saturday morning in May 2009. We were such innocents at this time. 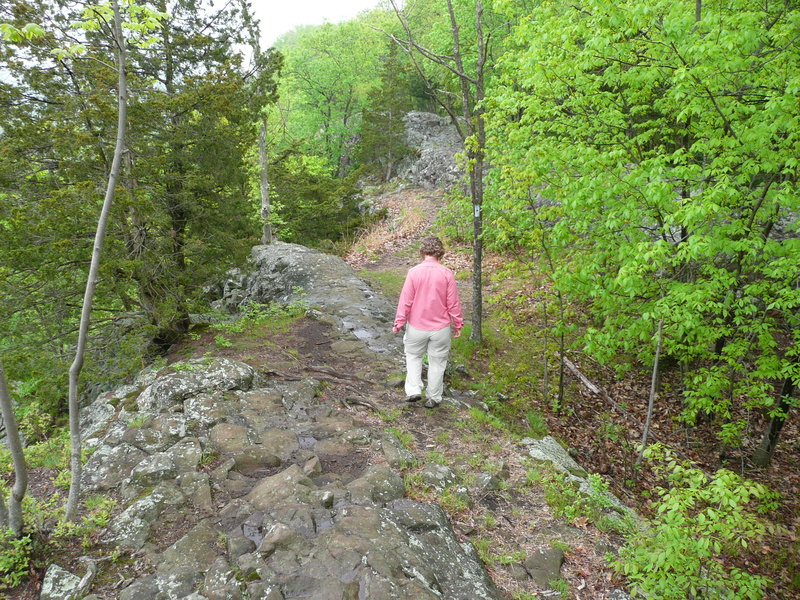 We set out to do the 5.5 loop trail on part of the Metacomet. No problem we thought, while planning from home. We arrive to a trail that was wet, muddy and slippery. I had simple hiking boots on, without a good tread. I remember thinking the first half mile going up, what have we gotten in to? What is Mike thinking about this? Are we really cut out for this? Well, we have to finish this and this just might be our one and only hike. Did I enjoy it at first? NO. I was scared of falling in mud, slipping and hurting myself and I don’t like the rain that is starting to fall on us. I don’t even have trekking poles to help me out or my own water supply. My whining stops abruptly when we overlook Martha Hart Pond. All of a sudden, I had a mind shift and felt the awe of being in nature. 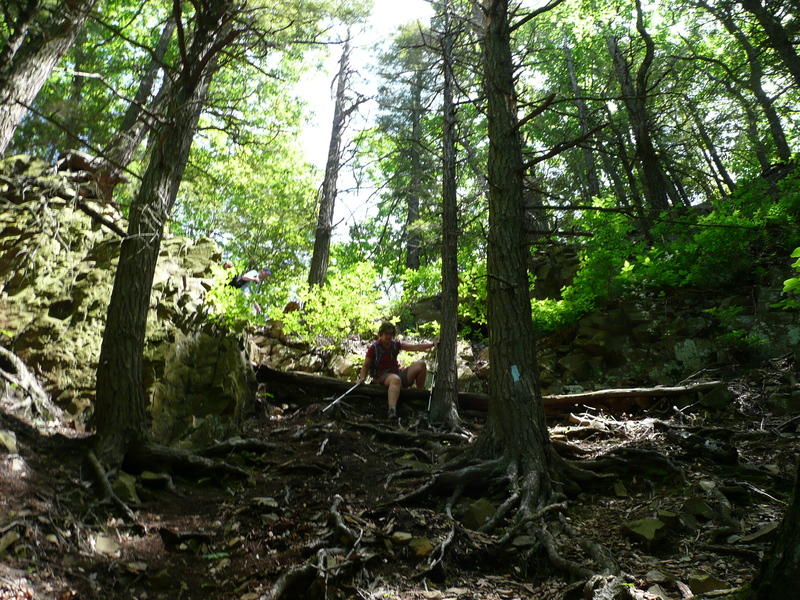 I was nervous about crossing the rocky ridge line in wet conditions without poles but something kept pushing me forward. I was starting to feel anticipation of what the next view would bring, what magic would I see? 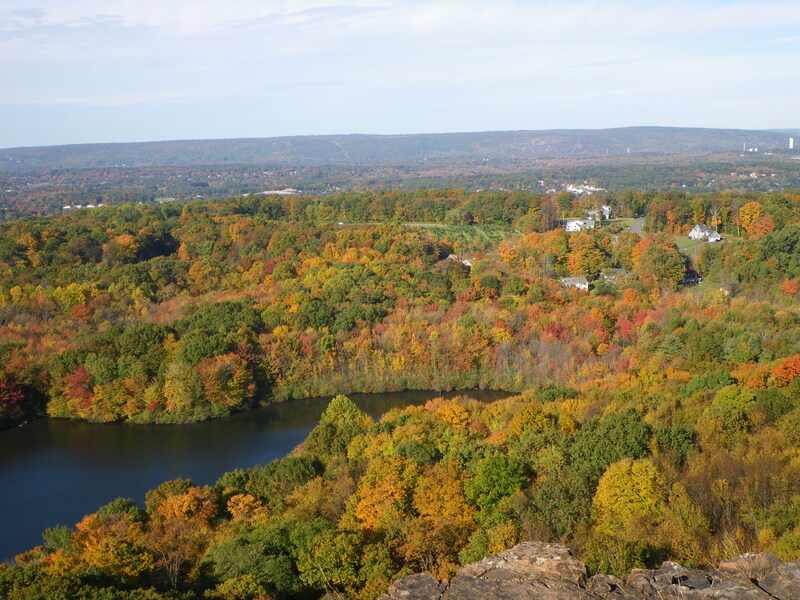 We join up with Metacomet Trail, following it to the summit of Ragged Mountain. The expanse of this area is windswept grass behind the cliffs that drop right down. This is where the hike becomes exciting for me. As we exit this open area, something catches my eye hiding in a bush, it is huge and slithery, a black rat snake. I choke down my fear, to snap pictures. All the while, willing it not to come at us. Luckily he enjoyed posing for us and after a few shots, we left him in peace. I have a swing in my step, we continue on our way. The rain clouds have moved away, we have discovered red-spotted newts crawling on the path and found a beautiful vernal pool. We’ve started to look around and see the beauty of the forest surrounding us and occasional views looking out that inspire us to keep going. As this hike winds down, we hear a strange sound. We stop dead in our tracks to this metal clinking repeating noise. Is there a strange animal that makes this noise, we wonder? And the answer is yes, golfers hitting golf balls on a golf course. How could this hike, that had me scared at the beginning, get any better? Simple, walk up next to a waterfall. It was beautiful and calming. As we amble back to our car, we carefully approach how we felt about this hiking thing. We both had the same feelings, scared, unsure at first, but by the end we LOVED it. We know we will keep returning here because we still have more to discover on this trail. The next day finds us at REI and EMS buying gear to keep us safe and prepared. 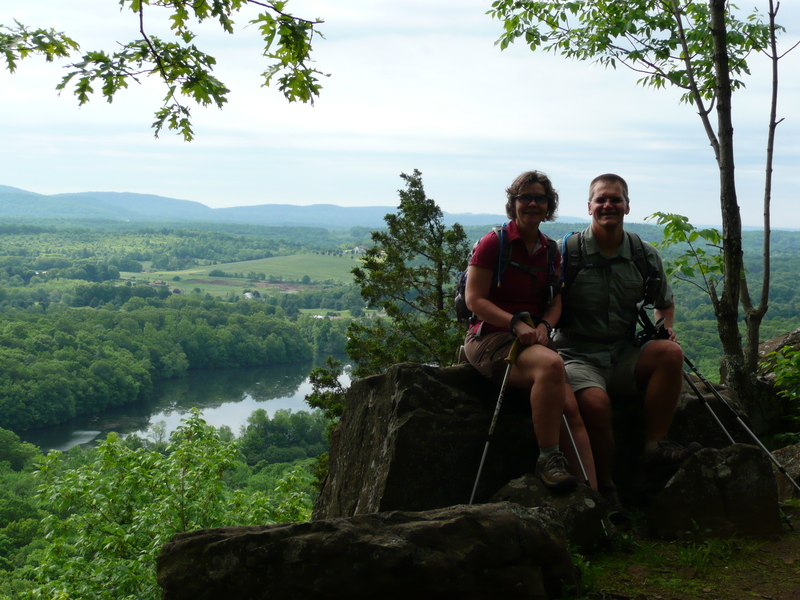 We purchase trekking poles, camelback daypacks, extra water bottles and a first aid kit for our next hiking adventure. Not even a month later we return to Ragged Mountain with friends to do a point to point. We start at West Lane in Berlin and finish at Rogers Orchards in Southington. This was a beautiful sunny day full of promise and excitement. We saw another black rat snake, a sign that this was going to be more fun than last time. We did ups and downs, challenging climbs and some areas sliding down on our behinds. We were so happy to share this beautiful place with our friends. We had a tiring 7.5 mile hike that taxed our bodies, but fed our spirits. Mike and I returned on an oppressive July afternoon to do an “exercise hike” up to the point where the trail meets the Metacomet. It was a quick sprint up and back on an extremely humid day in the blazing sun. It was glorious. We skip ahead to October, a quintessential New England fall day. Mike and I return to repeat our first hike. How could we ever tire of this place? The seasonal changes are stunning and things we see on our hikes here are so unexpected. In the fall the ravines fill with painted leaves, making it appear we have a river of fall flowing. Looking out on the hillsides the colors of the trees look like an artist pallet. This area has captured our hearts, so of course we had to hike it in the winter. For me, this was the best time to be in Ragged Mountain Preserve area. We decided to play it safe and not do the ridge walks, but walk the non blue trails. It was a glorious snowy day in January. The snow was wet and heavy falling down on us. You could hear the quiet of the forest gather us in her arms, as we hiked along our 3.6 miles. . We had many a stream crossing, cleverly crafted ice flows and footprints of many a creature. 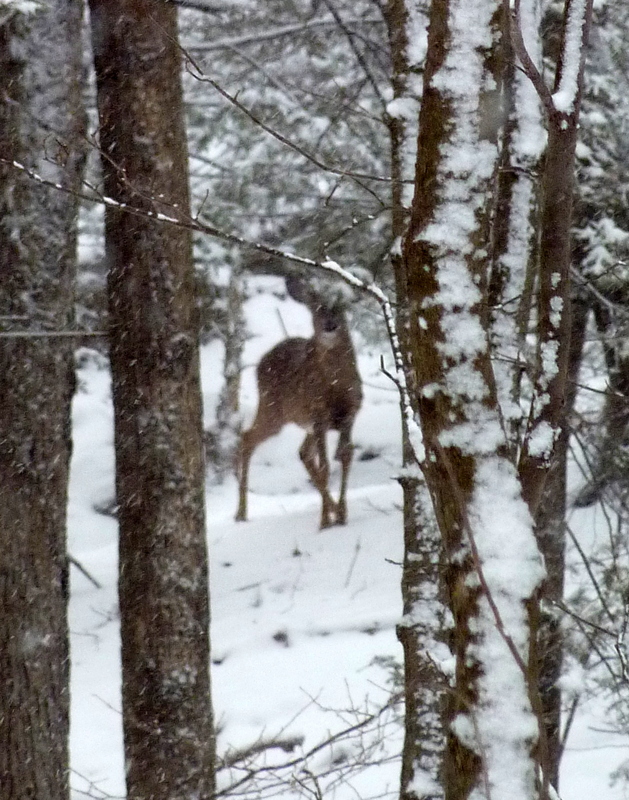 The true peace of this place appeared off to our side, four deer tiptoeing through their woods. Only one stopped and posed for me, but for that I am thankful. This place makes us both very happy, a happy that comes from deep inside that is encased in peacefulness. 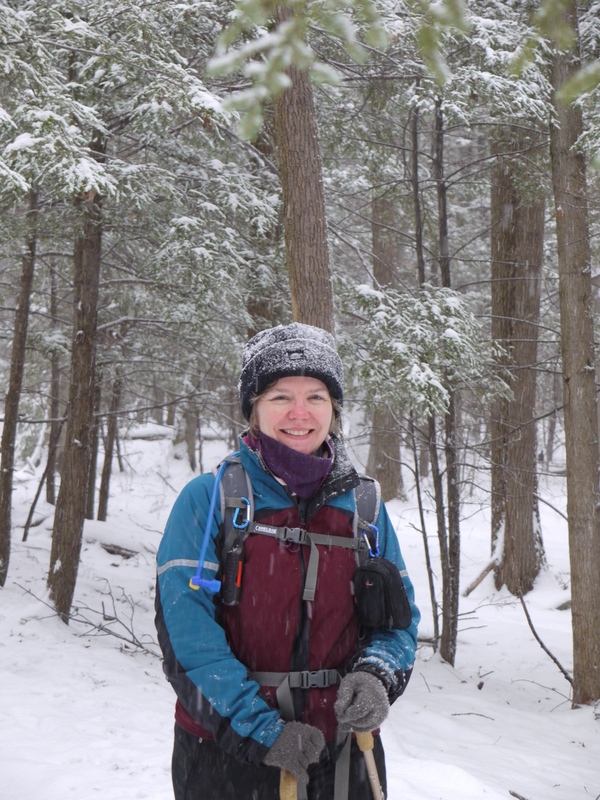 I truly believe this is one area that every hiker should experience, in whatever season they choose, because this forest and vistas give of themselves unselfishly. Until the next hike…. Details: We always park at West Lane in Berlin to do the loop trail. The point to point was started here and we finished at Rogers Orchard in Southington, with a short road walk. Be prepared for ups and downs and climbers use this area, so don’t be frightened if a head pops over the cliff. 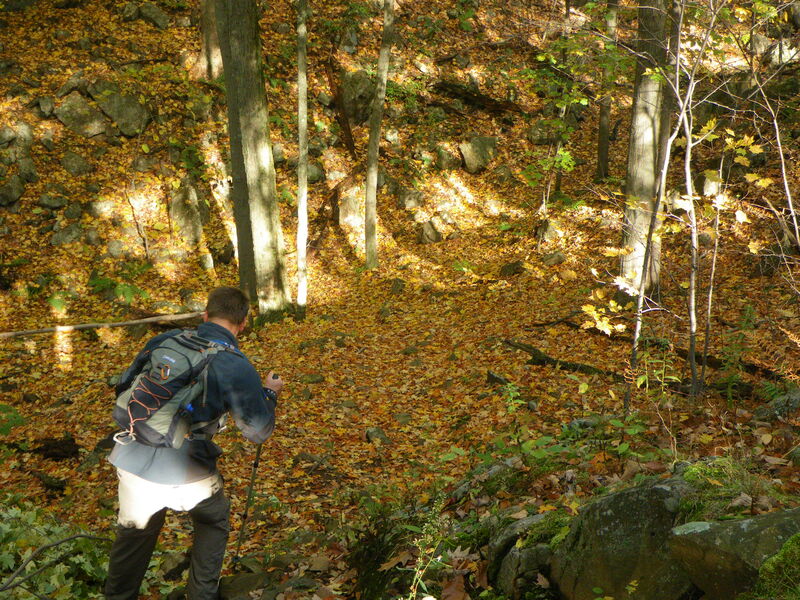 How cool to see the same trail in different seasons… great post! Yeah, well I love winter hiking, but I don’t know about seeing ANY kind of snake during the other 3 seasons. You seem fine with the sight of a snake now. 🙂 Love the deer picture… he was totally posing for you!